In November we will be spending time with the 14th century Japanese Zen Master Bassui—a name which means “far above average”, a title bestowed by Kohō Kakumyo ( 1271-1361) who was one of many renowned Dharma-masters Bassui encountered along the way to full Self-realization. 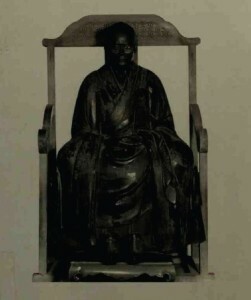 His own discussions with monks and nuns as well as lay adepts have been compiled under what has come to be known as ‘Mud and Water’, or Wadeigassui which is part of a longer title indicating that the talks originated from the city of Enzan where Bassui was to become abbot of Kōgakuji Temple. We will soon discover, though, that Bassui abhorred “titles” and any manner of regimented religious institutionalized settings. By and large he was a zen-recluse who developed a most genuine insight into what it means to own one’s Buddha-nature. Also, the series of “talks” we will be encountering are not “formalized Dharma-teachings” but rather more along the lines of Dharshan, a Sanskrit term meaning ‘auspicious encounters’ with a revered spiritual master. Before entering into Bassui’s Dharshan sessions some biographical notes are in order. For him, drunkenness was not only of the psychophysical kind, but also becoming too drunk on spiritual principles as well. His only ‘expedient means’ was to shake people from their mental stupor by pounding-away and loosening any form of obstacle that prevented unequivocal ‘direct-seeing’. This entry was posted in Mud and Water: Bassui Zen and tagged Bassui, Bassui Zen, Dharshan, Kannon, Kohō Kakumyo, Wadeigassui, Water, Zen. Bookmark the permalink.